Find products that are perfect for your next project. The best tile for your project. The premise of Terrain branded product is simple: produce beautiful + durable materials to the budget of the project owner. Whether you are a boutique hotel in Santa Barbara, Dubai or Saigon; a chain of coffee houses or wine bars; a spa and wellness clinic, or a villa in wine country, Terrain materials can provide a solution for your design or budget. 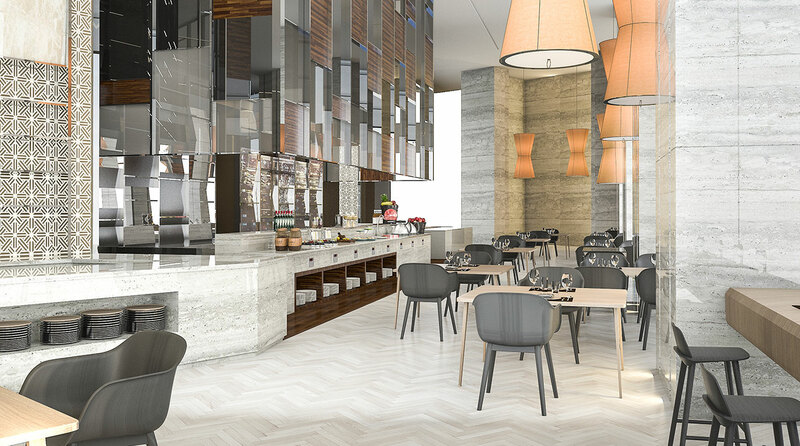 Hotel development groups, hospitality designers, general contractors and estate owners are all welcome to collaborate with our team of international material specialists to generate design solutions or budget correction. Bespoke signature installations that can identify the space or your brand are all possible through our R+D team. Based in Los Angeles, with both Asian and European product management offices, we take your project seriously with quarry and plant management, product inspection and global logistics to ensure the highest standards for your project. We invite you to contact us to review your project needs. In addition to the stocked and custom order materials on our website, we produce hundreds of products each year that were unique to the project for which they were intended. If you need a budget or product solution for something that is not part of our Terrain branded offering, our librarian can provide quick answers to your enquiry.